OK – before I even start on this, I should know better – this sort of thing has happened before. Let me begin by saying that I love Lenovo gear. I like the build quality and durability. I prefer trackpoint over touchpad. I’ve had 4 Thinkpads over the last decade and they’ve all been brilliant. I have two Lenovo netbooks in the house, I’ve bought more for family members, and recommended them to friends. At my last company I bought Thinkpads and a ThinkCentre for the team. I just wish that they could deliver what I order from them without a run around, and that almost never happens. My son has been complaining about his computer being too slow, and he could do with having a laptop for school. The deal is that if he can reach 20 words per sec typing, then he gets a new machine. In the expectation that he would hit his target I did some shopping around and the newly released Lenovo X121e stood out as being a great value machine – not the cheapest that I could get, but a great price/performance package, and something that I expected to last (and sustain the rigours of life in a school backpack). I ordered an X121e on the 3 Aug – a base spec Intel Core i3 model with the 6 cell battery and a sleeve cover. Quoted delivery was 1-2 weeks. Things got off to a bad start; after completing the order process the items were still in my basket online, but I hadn’t got any kind of confirmation. After a little while I called the sales line and was told that confirmation emails can take up to 24hrs to be sent out. It didn’t take 24hrs, but it was around 3hrs before my confirmation came through. The following day – excitement – a shipping confirmation email. Then disillusion – it was only for the sleeve cover. The cover came 4 days later (and I’m pleased to say that shipping tracking links sent in emails now work). The wait for the laptop continued – a shame, as I was hoping to have it in the office for a few weeks and maybe doing a review here – I had even taken an extra stick or RAM and an HDMI-DVI cable to work so I could tinker whilst waiting for the typing target to be hit. Today marked the expiry of the 2 week estimated shipping bracket, I thought about calling to check on status. After all the online order status is a bit cryptic – just what is ‘Boxed Shipment’ supposed to mean? I left it alone though. I’d read online reviews from people who’d got these machines, and they where still on sale on the web site. What could possibly go wrong? Anybody want an 11″ sleeve cover? I seem to have one without a laptop to go in it. Sadly my card has been charged for that item. Update 1 – 19 Aug – I called Lenovo customer services and spoke to a chap called Amis. He told me that the order had been cancelled due to parts shortage, but was unable to say which part they where short of or explain why the exact same spec laptop was still on sale on the web site. Amis accepted that there was basically no connection between what was on sale on the web site, and what the factory was able to deliver. He even suggested that I should order again, but could not explain why a second order would succeed when my first had failed. He is going to arrange an RMA for the sleeve cover, and I should get a full refund for that – though it’s extra hassle for me, and I’d expect that the shipping and admin costs are more than the value of the item. Maybe I should just order an AMD version of the X121e, as these seem to be in plentiful supply, and are a little cheaper than the Intel ones (and come with more RAM, though sadly a slower HDD). Update 2 – 19 Aug – just for lulz I thought I’d try ordering the same machine again, taking advantage of the 10% discount offered. I spoke to Amis once again, and he took the order by phone rather than giving me a discount code to use online. The discount applied to the order, the shipping costs and tax beared no resemblance to my own calculations, but seemed to be in my favour so I’m letting things run their course. I now await the confirmation email to see if something got mangled along the way. Update 3 – 19 Aug – the order confirmation has come through and all looks good other than the shipping address is my home rather than work. As I have little expectation that the machine will actually ship I’m not going to lose any sleep over that. Update 4 – 22 Aug – the laptop has shipped. Fingers crossed that there’s somebody home when it gets here. Thank you for contacting the Lenovo Online Store. confirm the cancellation of your order. Update 7 – 26 Aug – a happy ending. Not only was the machine waiting for me when I got home, but my son had also cracked 20WPM so it is now set up in the kids’ play room. Some proper setting up and a first impressions review to follow later. His younger sister recently benefited from getting my cast off desktop machine to replace an ancient Compaq iPaq. This makes the ‘sawn off laptop' seem a bit lame – something that was highlighted this week when he got a PC game that was released in 2008 that demanded a better hardware spec. My father in law managed to break the screen on his HP DV1000. I wasn’t able to fix it, and he’d got a new laptop anyway, so it was donated to the cause and has been in the kids’ playroom (minus the LCD screen and connected to an external monitor) ever since. After some pimpage, and with a bit of driver hacking it’s running Windows 7 quite sweetly. Great writing on your side! I had the exact same experience and being left with the sleeve I’ll be ordering my x121e again. Let’s wait and see what discounts I’ll be getting and if Lenovo can deliver. 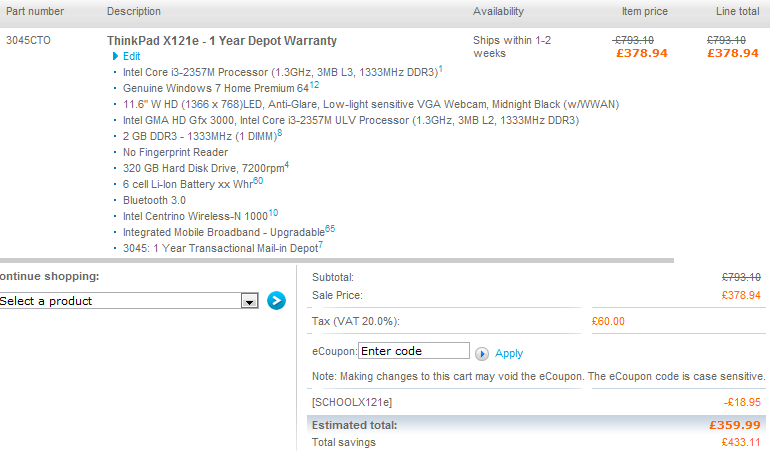 My original order was £364.70 for an X121e with i3-2357M, 2GB RAM, 6 cell battery and the sleeve (inc shipping and VAT). They charged me £14.34 when the sleeve was shipped. The new order has gone through at £318.47 for the same spec (and part number) X121e. I have no idea where this number came from. It represents a discount of just over 9% on the X121e that I had originally ordered, which isn’t bad considering that I’d used a voucher code in the first place. Of course it all counts for nothing until I have it in my hands. I decided to stick with the Intel version after taking a look at the various CPU benchmarks. I’ve just had the same message as per update-5 sent to me. What is about it that they cannot ship? I’ve selected black and upgrade to 4GB DIMM, the difference was that my original order had 2x2GB DIMM and Intel Centrino Wireless was an upgrade. The laptop is on offer on the website, you can’t miss it, it just begs to be clicked on and Lenovo cannot ship it. I am seriously p*** off by the whole story. First x120e isn’t available in UK, then x121e is available but only virtually. What’s somewhat insane here is that between sending me those emails, they’ve taken another order from me, for an identical product, and shipped it. This makes me think that the options selected may have little or no bearing on whether a machine ships or not. I’ve seen cases before when the reasons for not shipping have been software related – for software required by hardware options that weren’t even in the spec. The bottom line here is that there overall process isn’t connected and isn’t transparent – not a shining example of contemporary supply chain management (and very different to the Dell model where they promote various configurations based on real time part pricing/availability). 1) The relationship between Lenovo and Digital River is somewhat dysfunctional – Digital River are doing what their contract says, not what a Lenovo customer might reasonably expect. 2) SLAs are being used to drive processes in a way that isn’t customer friendly e.g. when you order a machine if it doesn’t ship in the time you where promised (like 2 weeks) then rather than being told that there’s a delay (and why there’s a delay) the order just gets cancelled and you’re told that it’s not available at all. I tried to place an order with Lenovo from August and because we request the order to deliver to a different address (the children starting uni) and messed up with the order, after that every time the promotion returns I resubmit the order and could never get through the payment stage (I tried one card after another). Eventually I made about 10 phone calls to digital rivers although each time they promise to lift the ban after 30 minutes I still can not buy a laptop for my sons. Almost a week ago I’ve tried to buy a Thinkpad on Lenovo’s website in UK which is not in fact Lenovo, but another company called Digital River with a dubious and fraudulent behaviour. After I place the order I receive an email claiming that the order has been received. However, the email did not specify the amount paid, the configuration of the laptop, the estimated delivary date, etc. Several hours later I received an email stating that my order was cancelled because I did not provide a “verifiable email address and phone number”. In the meantime, the transaction had been initiated on my credit card. I then tried to contact Lenovo / Digital River countless times using any conceivable avenue but they never answered my calls or emails. One week after this ordeal the transaction still appears as if it is in progress, the amount I was supposed to pay initially still has the status blocked on my credit card and my bank says there is nothing they can do. Moreover, it is impossible to contact the actual Lenovo in UK or anywhere in Europe. And to make things even worse, instead of solving my problem, they keep deleting my posts, rather than provide any support in solving this issue. It is shocking that they are even allowed to exist.